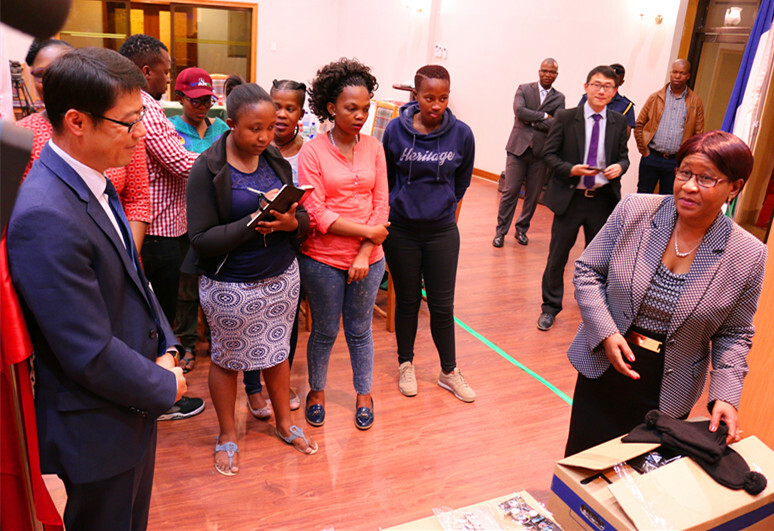 In an endeavour to enhance good cooperative relation between Lesotho and China, Chinese embassy on Tuesday handed over two batches of donations to the Ministry of Police and Public Safety. The donations included a cheque worth over M100 000, which is intended to to assist with green house project at the Police Training College (PTC), as well as Community Policing kit which entails blankets, gumboots and torches among others. When presenting the donations, Mr. Song Changqing who is the Charge D’ Affaires at the Chinese Embassy said the ministry of Police is so crucial to the peace and social security of Lesotho, thereby commending the police for the job well done in ensuring safety of the people including Chinese businesses and citizens in Lesotho. He added that Chinese embassy is happy to see that over the years, cooperative relation in public safety and law enforcement between China and Lesotho is getting closer, citing Police Minister’s official visit to China whereby the meeting with her counterpart, they discussed among other things issue of safeguarding social security and public safety. He therefore pledged to show Chinese government commitment in growing the relations between the two countries, saying they will continue to support LMPS in capacity building through equipment and supplies as well as human resources development cooperation to mention a few. Mr. Changqing also disclosed that China has agreed to donate a fingerprint examination lab to Lesotho. Receiving the donations on behalf of the Lesotho Government, Minister of Police, Mrs. Mampho Mokhele said by 2020, Lesotho will be a prosperous nation at peace as articulated in vision 2020, adding that the ministry is therefore committed towards this. She said Community Policing is one of the best methods in reducing crime, therefore saying by capacitating the community members, they will be able to effectively curb criminal activities happening in their areas. Also speaking was the Commissioner of Police (COMPOL), Commissioner Holomo Molibeli who expressed his heartfelt gratitude to the Chinese Embassy for the Community Policing Kit, saying it will go a long way in inspiring the Community Policing Committees in their efforts to fight crime in their areas. In the case of the cheque donated for PTC Greenhouse Project, he thanked the Chinese Embassy for the donation as it will enhance their intension to see the institution self-reliant in food production, saying PTC self-sufficiency in food will help the ministry spend funds allocated in many other things rather than food.